If your diet do-over plan is stalled, take control of your weight and your health by rewiring your brain to automatically make better decisions. These strategies from The FastBeach Diet will serve you well, whether you’re on the six-week diet plan or not. • Change the record. A study has revealed that up to 45% of what we do every day is habitual—performed without thinking in the same place at the same time in the same bovine way. We respond, automatically, to outside stimuli. Acting without thinking is a central driver of habits. Think about checking your emails. Getting a coffee. Where you sit to watch TV. The route you take on your bike to work. Your mission for the next six weeks is to undermine your instinctive bias for the status quo. Turn left when you usually turn right. Sit on a different seat on the subway. Take the stairs, not the elevator. When you experience a compulsion to eat too much, or to eat badly, it’s time to face it head on. You are a rational being and you are making a specific, time-sensitive decision to eat that cheeseburger or pour that glass of wine. You really do have the power to choose, at each incremental, individual moment. Once you recognize this power, it is possible to overcome the cognitive bias that leads to impulsive snacking and compulsive eating. Try to install a behavior—not forever, just for this precise moment—which alters your established route. This is called “deliberate practice”; it takes grit and determination. Leave the table. Stretch your legs. Don’t eat in front of the TV (throw out the tray that makes it possible). Change the picture. • Be specific. Research shows that vague plans are more likely to fail—so avoid abstraction, waffling, and generalizations. Think through exactly what you are going to do, where you are going to do it, and at what time. For example, instead of saying that you will go running two days a week, tell yourself that you will run on Sundays and Wednesdays at 7 p.m. Instead of saying “I’ll cut back on treats” say “I won’t have my morning muffin.” Similarly, as we’ve established above, if you want to lose weight, there is a psychological advantage in setting a specific goal for how much weight (10 pounds? ), by when (August 15 when you fly to Miami?). • Think carrots, not sticks. A study from the University of Chicago outlines how positive feedback on new habits will increase the likelihood of success. Don’t be afraid to recognize and grandstand your achievements. Website forums make an ideal platform for a bit of back patting— go to www.thefastdiet.co.uk to find tons of support and praise in action. Plenty of people on our site say that this is often enough to get them through a tricky patch. • Decode your brain. Appetite is governed by a complex interaction of hormones, neurotransmitters, and enzymes—and we don’t have a clear picture of the precise interrelations at work as we eat, or as we fast. What we do know is that hunger has a biochemical basis: grasping just a little about what your hormones are up to can really help when you’re attempting to change habits or overcome temptation. Let’s return to leptin, the satiety hormone which encourages you to stop eating when you’re full. Its message can be readily overcome by the reward systems in your brain. This “hedonic eating” may be a response to any number of outside influences: you’ll recognize it if you eat for reasons other than hunger. The kicker might be social (shared lunches, communal eating, everyone at the table agreeing to order dessert); it may be environmental (scheduled mealtimes which persuade you that you’re hungry simply because one o’clock is lunchtime,” the arrival of the bread basket at the beginning of a meal), or emotional (comfort eating, the popcorn that makes a movie more of a treat, the tub of ice cream demolished when you’re feeling blue). Try, then, to decipher your hunger. Are you really hungry? Or are you overriding your brain’s satiety message? Even posing the question can be enough to still the urge. According to Fogg—and it’s an appealing proposition—by breaking down each resolution to discover what the smallest constituent habit could be, your chances of succeeding will be 50% higher than if you leave it vague. • Know your triggers. Recognize—before it happens—when your self-control is likely to dissolve. Discover the cue that drives a poor habit, and change the reward. If you’re always ravenous when you get home from work, make sure there’s an apple stashed in your bag to eat en route, so that you don’t demolish a pack of cookies as soon as you’re through the front door. Have business lunches in the office or in a park, not in the restaurant where they serve the world’s best tiramisu. If you’re prone to a late-night forage in the fridge, run a bath instead. Know your food fault-lines—it might be chocolate, ice cream, cheese. In my case, it’s dough. For six weeks, commit to a moratorium on your nemesis. Don’t buy it. Walk past it. Even demonize it. After six weeks without sugar in your coffee, you may find that the very idea of it makes you shudder. Start small: Make The FastDiet Cookbook‘s Oatmeal with Jewel Fruits recipe for breakfast! With a foreword by Dr. Michael Mosley, this is FastDiet 2.0, a complete diet and exercise plan designed to help you get your ideal beach body in just six weeks. 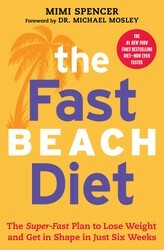 The FastBeach Diet by Mimi Spencer is a modified, high-intensity version of The FastDiet that will help you get beach-fit in no time. With a full-color, week-by-week planner to keep you on track, this speedy diet plan won’t let you down.